U.S. markets lost nearly $2 trillion in October. The biggest technology stocks — most well-known as FANG — were among the hardest hit this month. October was a rough ride for U.S. stocks, which despite regaining a portion of the month's losses Wednesday ended as one of the worst months since the financial crisis. The S&P 500 lost $1.91 trillion in October, according to S&P Dow Jones Indices analyst Howard Silverblatt. Losses were spread widely across industry sectors. October was the worst month for the S&P 500 since September 2011. "October volatility is legendary, and we're not just talking about the crash in 2008," Silverblatt told CNBC. 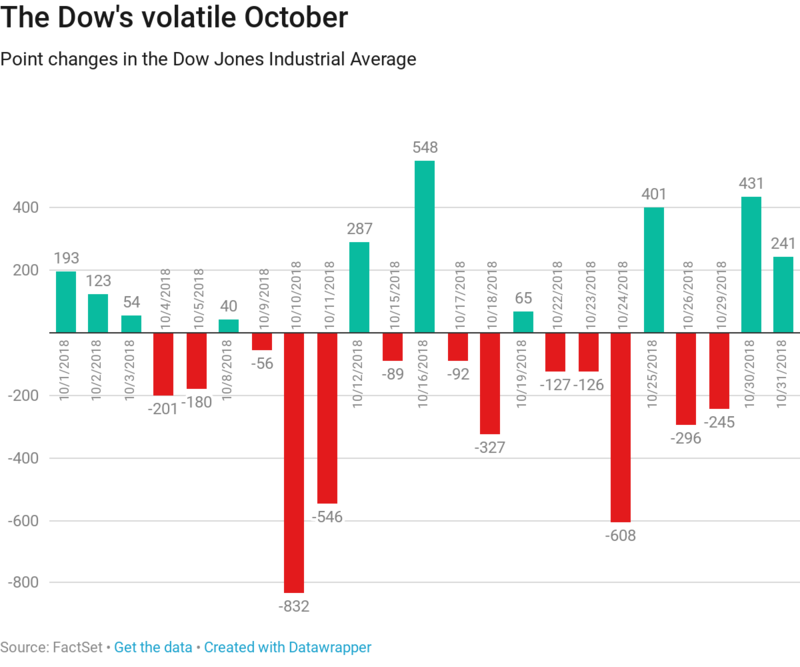 "October is a much more volatile month than any of the others as far as quick declines go." The month kicked off on a rocky note for stocks when Federal Reserve Chairman Jerome Powell said the central bank is "a long way" from neutral interest rates. Powell said the Fed does not need the policies put in place that pulled the economy out of the last financial crisis. He declared that "we don't need" the "really extremely accommodative low interest rates" the central bank put in place a decade ago. The Fed is likely to raise the federal funds rate to 3.4 percent before pausing, according to the most recent projections. Big technology stocks — most well-known as FANG: Facebook, Amazon, Netflix and Google parent Alphabet — were among the hardest hit. Amazon ended the month down 20.2 percent, and Netflix ended down 19.3 percent. Investors fled both after earnings reports. Facebook and Alphabet finished October down 7.7 percent and 9.7 percent, respectively. The S&P 500 lost 6.9 percent in October, its biggest one-month slide since September 2011, when it fell 7.2 percent. The S&P 500 slipped past two closely watched levels on Oct. 26. The index fell below its 200-day moving average and dropped more than 10 percent from its intraday high hit on Sept. 21, a correction as defined on Wall Street. The 200-day moving average is one of the most popular technical indicators used by investors. October is set to be the fourth month this year that the S&P 500 bottomed at that key level. The Dow Jones Industrial Average closed down 13 days in October. Both the Dow and S&P 500 are slightly positive year-to-date. The third-quarter earnings season was also on track to have been the worst for stocks since 2011, according to Bespoke Investment Group on Oct. 23. Roughly three-quarters of stocks had suffered a one-day decline on their earnings results this season, Bespoke found. The poor stock reactions were despite this third quarter being much better than last year's earnings season, with nearly 8 in 10 companies reporting better-than-expected earnings. Dow components such as Caterpillar, 3M and DowDuPont were especially battered following earnings reports. Company leaders commented on increased costs from global risks such as rising interest rates, a strengthening dollar and the trade war with China. "While this is a significant pullback, some of it does appear to be reallocation and money is sitting on the sidelines," Silverblatt said. "That should gives us a stronger base. Earnings were good but perception is everything: We expected a lot more." The dollar index, which measures the strength of the U.S. dollar against a basket of currencies, rose 2 percent in October. Semiconductors were one of the hardest hit sectors in the stock market. The VanEck Vectors Semiconductor ETF fell 12.2 percent, its worst month since 2008. Shares of Nvidia, Advanced Micro Devices, Micron and Applied Materials are all down double-digits for October as shares sold off following the companies' earnings reports this month. Those chip giants are also all in what some traders consider 'bear market' territory, down more than 20 percent from their recent highs. AMD has had a particularly rough month — that stock was far and away the best performing stock in the S&P 500 at the end of September. But shares have plunged 41 percent in October, its worst monthly performance since 1992. – CNBC's J.R. Reed , Kate Rooney and Fred Imbert contributed to this report.